I was always fascinated with the thought of travelling to Rajasthan. I grew up with many interesting stories related to it, and was always impressed. The stories of their culture, their forts, people, sand, camels, traditions, food, festivals, sand, etc. Everything seemed so interesting. I have travelled all over India, but never made it to Rajasthan. Then one day, I received an invitation for a wedding ceremony of my friend. 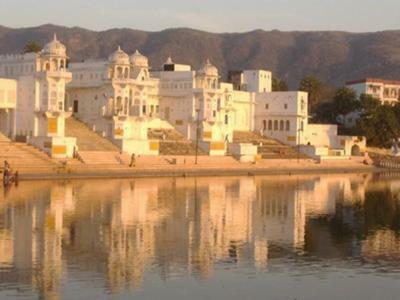 The ceremony was to take place at his native place, Pushkar, Rajasthan. There I was looking for an opportunity and here it was. So, we all friends planned our trip. We decided to make it to Pushkar first and then carry on with the rest of the places. I had an endless list of places, I wanted to visit. Like, Jaipur- The Pink City, Jaisalmer, Jodhpur,Mt.Abu, Shrinathji and many many more. We all started as per our schedule and reached Pushkar one day before the wedding. Everybody gave us a warm welcome and the hospitality was overwhelming. The wedding ceremony started on time. It was very different, sort of a traditional wedding, and looked good to us.The bride was very young, maybe 17-18. One thing that captured our mind was that, all the girls in that village, just kept talking about their wedding.Majority of them were not even more than 12-13, but they all were pretty excited to talk about their marriage plans. What they would were? How they will get married? How many kids they'll have? Well! We wondered whether they even made it to school; or even if they did, whether they really cared. Marriage seemed to be the ultimate goal of their life. Pretty primitive. They didn't bother about anything else happening in the world, other than marriage and movies. Anyway! my friends wedding turned out to be just fine and after staying there for an another day, (since we visited the famous Pushkar temple that day), we left for the other destinations in our list. We visited Jodhpur (I loved it), Jaisalmer(beautiful) and Jaipur. I wondered what was so pink about Jaipur. It seemed pretty crowded and bit dull. I wasn't really impressed with Jaipur except for the fort. We visited few other places and headed straight to Shrinathji, our final destination. The visit to Shrinathji seemed just fine, until we headed for the temple. Shrinathji is a very famous pilgrimage in Rajasthan. There were thousands and thousands of devotees waiting outside for darshan. The temple door was closed and we wondered why. Then someone told us, that it opens only for 15 minutes and that's when everybody should finish taking darshan. I wondered how so many people can enter the temple in 15 minutes. There was no queue either. We realized it was a bad idea and decided to go back. But! I think, we were a bit late. The temple door opened and well! you can imagine, all the devotees rushed to enter the door. They just pushed people standing in front of them. Nobody cared for anybody. Kids started crying and it was a total chaos. We didn't know how to come out of that mob. It was impossible. The only thing that was possible was to go with the flow, but the scariest fear was of getting crushed. In the end we made to to the door and kept holding it, till we got some space to come out of it. We were totally suffocating and felt alive as soon as we made it out. Though we couldn't take the darshan, it didn't really matter anymore, since we made it alive. Overall my trip was pretty happening, apart from this one incident, that still brings shiver down my spine, whenever I think abut it. It was a nightmare.I definitely went back to Rajasthan once more a little later, visited few places which I had admired earlier, specially, Mt. Abu. But this time the thought of visiting Shrinathji didn't even cross my mind, even once.